The Utah GIS community accomplishes great things when working together. The UGIC Conference, the many GIS User Groups, and datasets like Statewide Address Points are some examples of the community working together to create meaningful products. This website is no different; contributions to gis.utah.gov are welcome and encouraged! How to create a post on gis.utah.gov from AGRC on Vimeo. We have a great article that describes two methods for editing existing content on the gis.utah.gov website. When you, your group, or your employer have content that would benefit the audience of gis.utah.gov, please consider publishing it here. The ease of contributing stems from the website being hosted on GitHub.com. Once you have gone through the process once, you will be an expert. You might consider watching the above 1 minute video to reading the ~900 words below as they both describe the same process and reading will take 4 minutes longer. The first decision an author needs to make is whether to create a Post or a Page. Differentiating between the two is done by the type of content being created. If your content is newsy or time sensitive, then it would be considered a Post. If the content has permanent value and fits into the organizational structure of the website, then it would considered a Page. If you are having trouble deciding, always choose a Post. The ever resourceful Scott Davis created a great tool, the Templater, to create a starting point for authoring new content. This is the entry point for all authors creating new content. Start by creating a title. This will be used to create the url on the website and also the heading for the article. Next choose your content type based on the decision above. Fill out the Author information - This will be displayed above the title on the post. Please use your full name. Once you click Generate, the templater will present you with a File Path and Contents. You will need a GitHub account to participate, so create a free GitHub account if you do not already have one. Navigate to the agrc organization on GitHub and find the website source code. 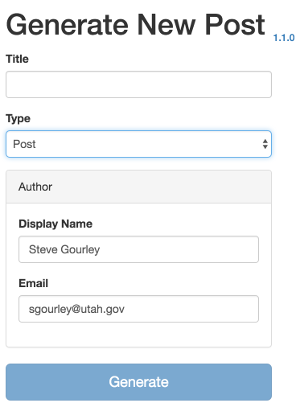 Fork the repository to create a personal copy of gis.utah.gov website in the GitHub cloud. The gis.utah.gov website is generated using Jekyll. Jekyll is a tool that aids in the creation of the websites content as well as the look and feel. Jekyll dictates how the website directory structure is organized. New Posts should be placed in the _posts folder of your fork (https://github.com/YOUR USER NAME/gis.utah.gov/tree/master/_posts). This can be accomplished by clicking the New File button. Copy and paste the content generated in the File Path input that the templater created. The Templater adds the _posts/ prefix to the file name so make sure you create the new file from the root of the website or you might create a new folder in _posts/_posts/your-new-file.md. Pages can go anywhere in the website structure. To achieve the extensionless urls, an index.md or index.html file is created inside of a folder. The folder name will be the url to the content. eg: gis.utah.gov/folder-name. Folders can be nested within folders as can be seen in the existing structure. The templater will take care of the naming, therefore clicking the New File button and pasting the content generated in the File Path input should give the desired result. By default, the templater has given the new file a .md markdown extension. There are many implementations of markdown, but all Jekyll websites use kramdown. You have the choice to write your post in html or markdown. Please update the extension to match your choice. The templator has created the YAML Front Matter required to display your new content correctly. You can ignore that. Copy and paste the Contents text from the templater into the Edit new file location of GitHub. You can continue to author your content in GitHub or use your favorite text editor. Once you are finished, write a commit message and commit the new file. By convention, the gis.utah.gov website places all of it’s images in the images folder and all other assets (PDF’s, text files, etc) in the downloads folder. From the images or downloads directory in your browser, drag the assets you would like to reference in your post on to the browser window1. GitHub will recognize this and upload the assets. Finally, add a meaningful commit message describing the changes and commit the changes. To close the contribution loop, a pull request must be created asking AGRC to pull in your commits to be incorporated into the website. In your fork of the website, there will be a Pull request button. Clicking this button and following through the steps to completion will summarize the changes made and send a notification to AGRC of the request. The pull request creates a link between your branch and the AGRC repository. Any subsequent commits will show up in the pull request. It is a living connection while the pull request is open. This gives AGRC and the contributor a chance to have a discussion and fix any errors. Once the pull request is accepted and merged, the website will automatically regenerate and deploy to production. The edits will be live, @MapUtah will tweet about the new content the AGRC facebook page will post about the new content. Once this process is completed you are safe to delete your fork of the gis.utah.gov website. You should no longer need it and it will quickly become outdated.